THE GAMES MUST GO ON! A little thing like weather can’t stop SPX tradition. Spring 2019 A little thing like weather canâ&#x20AC;&#x2122;t stop SPX tradition. spring season. This year, SPX Softball was scheduled to join the festivities and host their inaugural Alumni Game. The players were invited, the jerseys were ordered and an after-event gathering for the players and the alumni was planned. However, on the Friday before the games, Albuquerque weather began to change as the temperature dropped and storm clouds rolled in. Knowing that several alumni were in route for the game, the Coaches and Athletic Department Staff decided that the games would go on! Coach McCoy speaks about the past, present and future of Sartan Baseball. As luck would have it, it snowed all evening and standing snow on the fields brought on a new challenge. 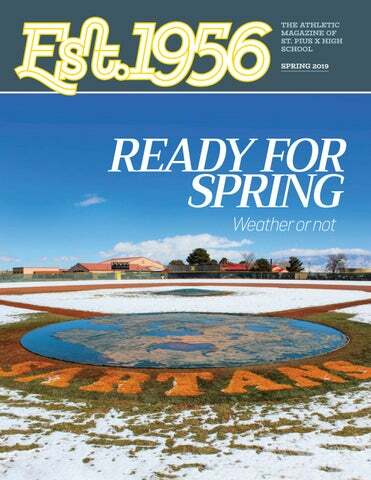 Despite the snow, Sartan spirit prevailed and several Baseball and Softball Alumni from the last three decades arrived the morning of the games to play ball. Coach Doyle stated before the first pitch, “This is a great way to bring the past and future of our program together.” The SPX Softball Team was able to clear the field with the help of our dedicated parents and the Alumni prevailed with a 15-4 victory over varsity. Lorriane Trujillo Martinez ’83 was thrilled with the experience, “I’d like to thank SPX and especially the girls for being so welcoming to me after so many years off the field. I had a great time! I can’t move like I did 36 years ago but it was really fun to get back out there.” Unfortunately, the baseball field was not able to be cleared due to the amount of snow and field position so the annual baseball game had to be redirected. The boys, coaches and alumni made the best of the situation and headed into the gym for a free throw contest and inspirational speech by Coach Matt McCoy ’89, “I am lucky that I have been able to spend time with the young men that have passed through the baseball program over the last 12 years. Each team builds a bond that lasts a lifetime during their time here. I want to thank these men for coming back today and I encourage you boys to ask them questions and learn from their experiences, both on and off the field.” A huge thank you to all the SPX Alumni that attended, either as a player or fan, the SPX Varsity Teams and our dedicated coaching staff led by Coach Matt McCoy ’89, Coach Gary Romero ’87 and Priscilla Doyle ’05. Winter was a great season for the St. Pius X Swim Team. Both the girls and the boys won two meets and took second place in two additional. The swimmers progressed steadily over the last few years, culminating second place finishes at The District Championships for both teams. The Sartans qualified for six relays for The State Championships, and all six swimmers advanced to the finals. Standout swimmers who qualified individually for the State Championships were Davin Ruggles (12), Rebecca Restrepo (12), Christopher Perea (10) and Leo Kim (9). All four of these swimmers moved on to the finals. Sartan swimmers finished second place at District! The girls Medley Relay qualified for State. SPX Wrestling, under the direction of Head Coach Damacio Page, is proving to be an up and coming athletic program at St. Pius X High School. In the two years he has been the Head Wrestling Coach, Coach Page has made SPX a known force in the wrestling community. 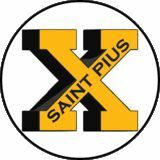 In the 2018-2019 season, four St. Pius X Wrestlers went to the State Championships and brought home the First and Second Place State Titles in two different weight classes. panel. The Dorados had an astounding ten dancers named All-Americans this year. Our All-Americans are: Elizabeth Freisinger (12), Morgan Henson (10), D’Andra Leyba (11), Patricia Lujan (11), Isabella Sais (12), Madeline Skipp (11), Amanda Stone (12), Allyson Thomas (10), Megan Thomas (12), and Donielle Torres (10). While in Italy, our traveling Dorados went to the Pantheon, the Trevi Fountain, Piazza Navona, the Colosseum, the Roman Forum, the Piazza del Popolo, the Vatican Museum, the Sistine Chapel, St. Peter’s Basilica, and more. They also had the opportunity to visit Florence. In early February 2019, the Dorados traveled to Walt Disney World in Orlando, Florida to compete in the National Dance Team Championship (NDTC). The Dorados competed in the small varsity jazz category against almost 100 of the best dance teams in the country. It is exciting to travel outside of New Mexico and see what is going on in dance in other parts of the country. Even more thrilling, is the feeling of stepping with your teammates onto the NDTC stage Tryouts for the 2019-2020 Dorados Dance Team and the SPX JV Dance Team will be in early May 2019. Please contact Coach Gina Rightley at grightley@spxabq.org for more information. Matthew McCoy is a 1989 graduate of St. Pius X High School. He received his Bachelor’s Degree in Criminal Justice from Wayland Baptist University. In 2015, he retired as a Sergeant from the Bernalillo County Sheriff’s Department. Coach McCoy began his coaching career at St. Pius X as a volunteer C Team Baseball Coach in 2007. He has been an assistant and head coach at all levels of the baseball program and was promoted to Head Varsity Coach in 2017. Coach McCoy was an assistant coach in 2013, the last time the baseball program took home the state title. As the Head Coach, Coach McCoy has two District Championships and appeared in the State Semifinals twice, losing both times to the eventual State Champion. He has also coached football at St. Pius X and has been a Varsity Assistant for the last two years. models for the young men that come out of the baseball program.” Coach McCoy would like to publicly thank Athletic Director Jim Cook ’83, for the opportunity to coach these amazing young men, and the entire athletic department; Ashley Turcotte ’07, Jennifer Maldonado ’91 and Juanita Marquez for all of the hard work they do on a daily basis to keep all the athletic programs rolling along. Coach Doyle is a 2005 graduate of St. Pius X High School. She was a varsity athlete all four years and a member of the All State First Team in 2003 and 2004. After graduation, she attended Western New Mexico University on an athletic scholarship and graduated in 2009 with a Bachelor’s Degree in Education. She also holds a Master’s Degree in Instruction and Curriculum. She is a School Instructional Coach at Madison Middle School. Coach Doyle began her coaching career as the Varsity Pitching Coach at Atrisco Heritage in 2012. In 2015, she returned to St.
Pius X High School to be the Varsity Head Coach. Coach Doyle is assisted by Roni Marquez and Jessica McBride. for Coach Turcotte, and he encourages his athletes to continue to “run for life” beyond high school. Coach Turcotte is assisted by Gabe Aragon, Dan Fant, Juan Garcia, Matt Larranaga ‘95 , Jennifer Pollard and Neil Silver, who originally hired Coach Turcotte in 1988. 28 YEARS AS A COACH 2 YEARS AS THE BOYS HEAD COACH AT SPX SPX BOYS RECORD: 13-10 1 YEAR AS THE GIRLS HEAD COACH AT SPX SPX GIRLS RECORD: 8-3 Chris Potter is beginning his 3rd year coaching at St. Pius X High School. He has a wealth of experience entering his 28th year coaching. Coach Potter has coached a wide range of tennis players from six and under to senior clinics and athletes from the ITF World Tennis Tour Pro Circuit. Coach Potter attended Mars Hill University near Asheville, North Carolina where he received a Bachelor’s Degree. He later obtained his Master’s from Baylor University and one week after graduation was hired as the Mens Tennis Coach at Pfeiffer University in Misenheimer, North Carolina. Coach Potter remained at Pfeiffer for over a decade and during that time took his team to the National Championship twice. Three of his former players went on to have an ATP/ITF ranking. been an inspiration to me. and students during his tenure at SPX. During retirement, Coach Tristani spends most of his free time traveling between Puerto Rico, Utah and Arizona where his son, Michael Tristani ’92 and his grandson, Bryke live. He is also still a regular familiar face around the halls of SPX as a substitute teacher in addition to coaching boys golf. He has an impressive record holding 21 state trophies in soccer and golf and two individuals in golf. average GPA (3.8) of the spring sports. He would also like to thank Coaches Maxcine Bates (2014-15) and Roy Turpin (2017-2018) for their contributions to the success of the St. Pius X Girls Golf Program. St. Pius X players and a girls team, with just three players from outside the Sartan ranks. Coach Wells successfully runs and owns an award-winning design studio with his wife, New Mexico Santera Retablo Artist, Sean Wells. They have two sons, Phoenix and Griffin who also swim and play water polo. Coach Wells is assisted by SPX Alum, Coach Nicholas Christman ’16. into their next phase of life. student athletes from St. Pius X, Ace Charter Academy, Albuquerque Academy, Atrisco Heritage, Southwest Aeronautics, Mathematics and Science Academy and Volcano Vista. Coach Neice is assisted by Ed Cole. Team $700 Individuals $175 Register today!